Having worked at The North Face, a brand that is known for athletes who push their limits beyond believable (to me and most civilians), I have always been fascinated with climbing. As fascinated as I am with climbing, I cannot fathom one’s desire and ability to climb all 7 summits (the highest mountains on each continent). So instead, I’ll read about them. 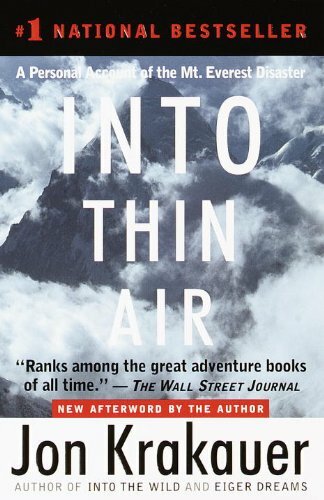 Into Thin Air follows Krakauer on an expedition to Everest, with Outside magazine. A mountain he has wanted to climb since a young boy. A journey he did not think would end up a tragedy. A journey that was marred with errors from the start. Krakauer writes the story and places you right there with him. The excitement when he was asked to join the expedition, the fear he experienced when he boarded the helicopter to Lukla, the wind chill he felt at 17,800 ft, the struggle he endured as he climbed up the Hillary Step and the sadness he felt when he read the hate mail from family members of the deceased. I envy those who have the courage to take the first step to climbing Everest, but with a fear of heights, I’ll be just fine here on my couch typing this post. Tags: Book, Everest, mountaineering, postaday, Read, Review, Travel. Bookmark the permalink.